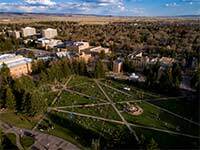 UW hosted the Blockchain Task Force for Wyoming meeting in May 2018. A major push for improved technology in Wyoming by the Legislature and the University of Wyoming received a boost last week when the inventor of critical Internet infrastructure visited Laramie. Wyoming Gov. Matt Mead’s Blockchain Task Force for Wyoming was established after the recent legislative session, when several blockchain-related bills were passed by the Legislature. Christopher Allen, who was one of the developers of the computer network communications security protocols Secure Sockets Layer (SSL) and Transport Layer Security (TLS), was among those who attended the task force meetings May 24-25 at UW. These protocols are used in applications such as web browsing, email and instant messaging. Websites use TLS to secure all communications between their servers and web browsers. Allen, who now is a blockchain security and decentralized identity standards architect and adviser with Alacrity Management, testified about setting up a new organization called Blockchain Commons in Wyoming. The new legislation will allow Wyoming to be the first U.S. state and one of the only places in the world to create a legally distinct asset class for blockchain, and positions the state to be a leader in the blockchain sector. Blockchain is a digital ledger for storing information, including cryptocurrency. Lawmakers have touted Wyoming as an ideal place for blockchain, given Wyoming’s need for economic diversification.